How does Fred sum up his time in North America? Fred: There’s twenty times more opportunities there but also twenty times more artists looking for a place in the sun. Though there are far more developed structures over there for artists to build a career: folk conferences, folk DJ lists, song contests and promoters ready to help the interesting performers find their feet. Fred won the Ploughshares Song-writing Contest in Phoenixville, Pennsylvania and was chosen from a field of 380 songwriters for an ‘Official Showcase’ at the North American Folk Alliance Conference. Fred: The conferences and contests are a strange environment to play your heart out in, but they certainly helped kick start things for me over there and I made a lot of friends doing them. There are far fewer festivals here but I think the ones we have are better. They are more about getting people involved and less about providing an altar for the worship of a handful of artists. Back home and Fred has slipped easily back into gigging and festivals. In late April he was one of the headline acts at St Albans where he played a ‘no repeat’ weekend over several main stage performances, involving a number of confederates and guest artists. Fred: It was nice to go St Albans and be billed for five shows on the main stage to an audience that knows me. I really felt free to play the full breadth of my repertoire from the comic to the melancholy. In most festivals and gigs the sets are short and the temptation is to play my own ‘hits and memories’ but in the long run there’s no risk or growth in that. And it underestimates an audience. It also gave me a chance to rope in friends like Penelope Swales and Chris Gillespie so that I could present a different aspect of my work each gig and experience the joy and edginess of playing with new collaborators. Having done a lot of solo gigging over the last three years, that felt great. 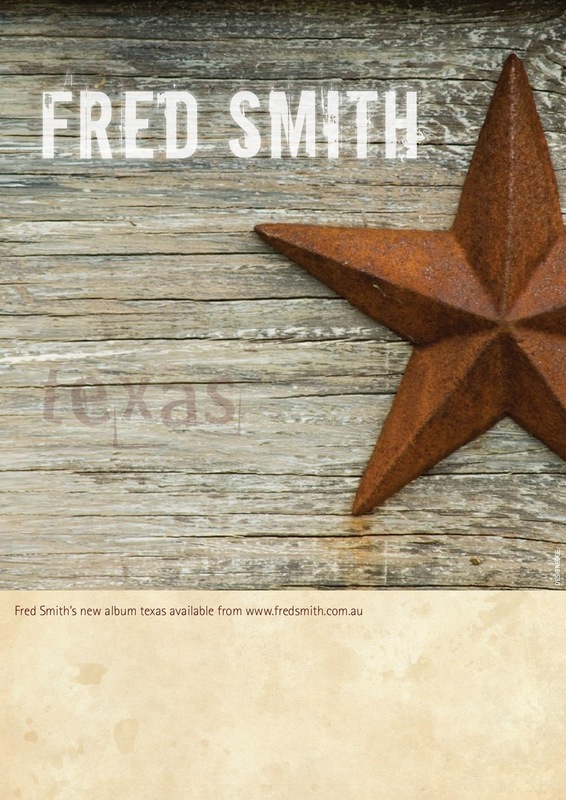 Having survived three years of living in Washington, interspersed with touring and gigging, Fred has collated his experiences, observations and a dash of US history and produced the ‘Texas’ album. It’s a meandering journey that’s the epitome of the performer himself: from the frivolous and light-hearted to the emotive and emotional. Fred sets out across the country this winter to play a string of dates (mostly with Liz Frencham) to promote ‘Texas’, following a couple of preliminary shows in home town Canberra over the Mothers Day weekend. The pulling power of Fred in his own neck of the woods is palpable: the Saturday night gig at Tilley’s is sold out a couple of weeks beforehand, and he still manages to pack an overflow gig in a church hall the following afternoon, with a 3pm kick-off. And on Mother’s Day, no less. Fred: I wanted to do a second gig where people could bring their kids. After three years in USA, I came back and all my friends have got kids. Given the demographic, Fred promises to tone down a few of his racier lyrics for the second show (“I’ll do the American versions!”). But he has at least one little slip up and has to quickly correct a lyric to, “This ship is going down”. And there was proof positive that the word ‘jolly’ can quite nicely substitute for another more expressive and emphatic adjective. One day I’ll calibrate a scale that can record the response an artist gets by measuring the attention they command by their presence and stagecraft. It will be gauged by the ‘Pin-Drop-O-Meter’. In Fred’s case, it just takes one man, one softly played guitar, and the gentle opening lyrics of ‘Into My Room’ to drop the needle down to zero. And we’re talking a room with more than its fair share of very small children with balloons and other distractions. Several songs later and the twilight zone factor returns as the crowd seems to instinctively and intuitively join in en masse on the first chorus of a song. Then the penny drops, and the reverentially-bowed heads remind me, that they are all singing off the same hymn sheet: lyric sheets with choruses to a selection of Fred Smith songs which went out around the crowd before the gig. And in the ecclesiastical surrounds of St John’s Church Hall, it’s all the more appropriate when Fred later announces, ‘God Bless America: that’s hymn number four’. Playing songs of American history and culture to Australian audiences. How does that play out then? And how does it compare to playing to US audiences? Fred: American audiences responded very warmly and I learned not to underestimate them. But in the end I feel Australian audiences really understand my songs — the language, the humour. By the end of my time there I had over an album’s worth of songs written about America. The more I sang about them the more they responded but that’s not unusual; people respond to music they can relate to. Australian audiences seem to be really responding to the ‘Texas’ songs, notwithstanding their American focus. Maybe they just enjoy a yarn and I certainly came home with a few of them. But also from our immersion in American TV and music we all have a strong sense of America combined with an appetite to take the piss out of Americans. That’s definitely where I started from but I like to think I got beyond that in the end because it’s a beautiful and complex country full of spirited people. There’s a palpable sense of the landscape political in ‘Texas’, reflective possibly of the fact that Fred arrived in the US the day after the 2004 US presidential election, then left in late 2007, as Barack Obama’s star was on the rise, arriving back in Australia in time to vote in the 2007 Australian federal election. Fred: [America is] an amazingly diverse country and at the moment, divided and traumatised. The Iraq intervention has polarised the body politic viscerally, and everyone you meet there is passionate about it one way or the other. As a musical development exercise, America was undeniably beneficial for Fred. Fred: I have come back from the US with a stronger sense of myself as an artist. Having played the same stages as the likes of James Keelaghan and Dave Francey, I know my writing is up there. And right about now, his music is out there. Fred Smith’s tour kicks off with a screening of ‘Bougainville Sky’ (a film about his peace-keeping work on Bougainville from 1999 to 2003) in Margaret River, WA on 13 June, and then it’s on to gigs in all points west thereafter. Your own article, “From the archives: Fred Smith – Taking ‘Texas’ to Tasmania (and Tilley’s, Tempe, Turning Wave…) � Overheard Productions (Bill Quinn)” ended up being worth writing a comment down here in the comment section! Merely wanted to point out you did a great work.